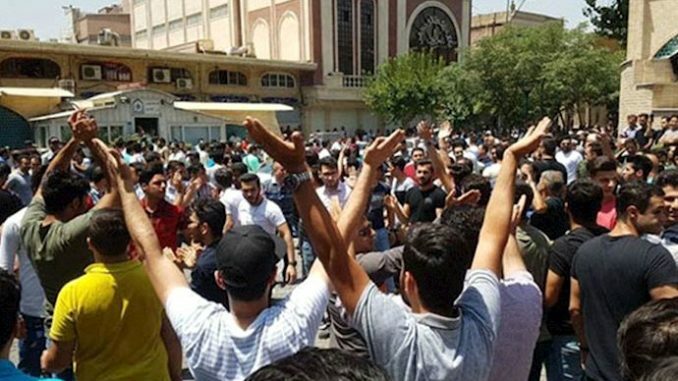 As anti-government protests continue , featuring chants of “Death to Khamenei,” the supreme ruler, the Islamic regime is faced with signs of economic and political collapse, according to an analysis, reported on by WND. The latest protest began last Sunday after the Iranian currency, the rial, hit a record low against the U.S. dollar. MEMRI analysts A. Savyon and Yigal Carmon said that “even if the protests die down or are repressed by the regime for a while, they will eventually recur and intensify, because the Iranian regime can offer no solution for the economic crisis except by changing its regional and nuclear policies”, WND reported. The protests, just the latest in social unrest gripping the country, began last weekend and have contibued , as anti-regime protesters express frustration over the plunging value of Iran’s currency, the rial, and Iranian leadership’s continued funding of regional terror groups and military operations in Syria on behalf of embattled President Bashar al-Assad, The Jewish Voice reported. Protestors are said to be fed up with the Iranian ruling regime’s focus on foreign intervention ahead of the country’s own economy, which has been even further strained since President Donald Trump walked away from the landmark nuclear agreement and reimposed harsh sanctions on Tehran. I wish success to the Iranian people!